Then each player, in turn order, chooses a portion, with the Slicer always choosing last. As players choose portions, they determine, for each slice, if they should collect it or eat it. After all of the pizzas have been sliced and distributed, points are scored on the Guest Checks the player with the most points wins! 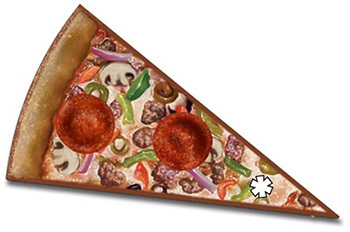 2 players: Remove 10 Meat Lovers, 8 Mushrooms, 3 Veggies, and the 8/10 combo slice with Mushrooms and Meat Lovers on it. 3, 4, or 6 players: Use all slices. 5 players : Remove 10 Meat Lovers and the 8/10 combo slice with Mushrooms and Meat Lovers on it. Shuffle the slices face down by placing the slices on the table and moving them around (be sure to use a tablecloth to ensure that the slices don't get scratched up from the table surface). Make face down stacks of 11 slices each. You'll have 3 slices left over; put these back in the box, keeping them face down. Shuffle the Specials face down and place one on top of each stack of 11 slices, keeping them face down. Place the rest of the Specials in the box, keeping them face down. The player who was the last to win any game is the first Slicer. Each game consists of a number of rounds equal to the number of stacks of 11 slices available. A round consists of one player slicing and each of the players choosing a portion, with the Slicer choosing last. The Slicer starts by choosing a stack of 11 slices and its corresponding Special. 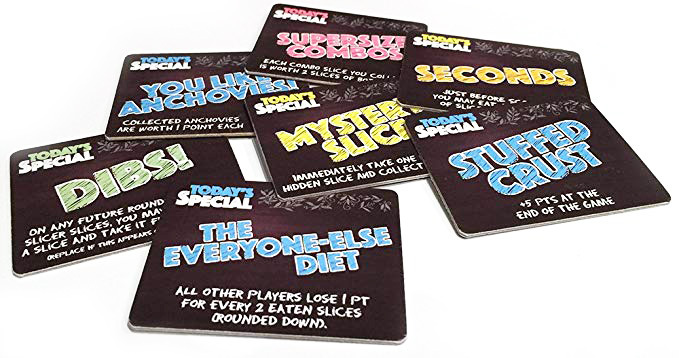 Then the Slicer first flips the Special face up in the center of the table, reading it to the players, and then flips each slice face up in the center of the table. As each slice is flipped, it is placed directly next to the previous slice; the Slicer must continue to place slices in the same direction (clockwise or counterclockwise), with each slice being next to the last. The 11 slices will form a circle, with the last slice being next to the first slice. 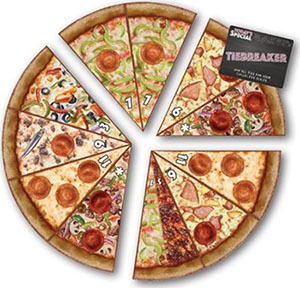 The Slicer then divides the pizza into as many portions as there are players. For instance, if there are four players, the pizza would be divided into four portions. Each portion can have any number of slices, as long as it has at least one slice or the Special (the Special may be either combined with slices or placed by itself as its own portion). When dividing the pizza, the Slicer may not rearrange or change the order of the slices in any way. Once the Slicer has finished dividing the pizza, the player to his left chooses a portion and takes all of the slices in that portion (and the Special, if it is part of that portion). At this time, the player must decide which slices to collect, leaving them face up in front of him and combining them with his previously collected slices so that all slices of the same value are placed next to each other (these face-up slices may be rearranged by the player as necessary), or if he wants to eat any of the slices that have pepperoni on them, placing them face down. Any slices may be collected, but only slices that have pepperoni on them may be eaten. Each player chooses a portion in clockwise order around the table, with the Slicer getting the last portion. Players should wait to choose their portion until the player before them determines which slices they are eating and which slices they are collecting. The player to the left of the current Slicer becomes the new Slicer, and a new round is played. Rounds continue until all the stacks have been divided among the players. After the last round, the game ends and scoring takes place. The player most likely to be able to figure out a tip becomes the Scorekeeper and takes the Guest Check pad to count the score for all players. 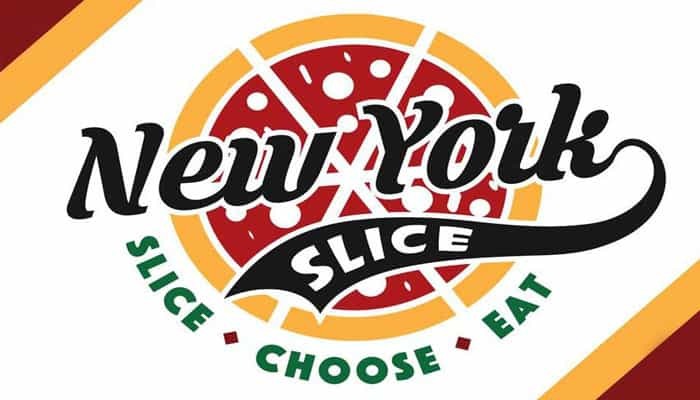 The Scorekeeper asks who has the majority of slices for each type of pizza, starting with Veggie 3 slices and continuing through Cheese 11 slices. The player with more collected (face up) slices than any other player receives that slice type's value (the number printed on that slice type). If two or more players are tied for the most number of slices of any type, no one receives points for that type. The scorekeeper circles the number that corresponds to each type for the player who has the majority of that type. If a player has a half slice of a type and no player has any slices of that type, the player with the half slice has the majority of that type. Next, the scorekeeper asks the players to total up the points received or lost from Specials marked with an * (they are all blue). Next, the scorekeeper asks the players how many points they earned from eating pepperonis minus any anchovies on collected slices. Players should count the number of pepperonis on all of their face down (eaten) slices, and subtract the number of anchovies on their collected (face up) slices, and give that total to the Scorekeeper. Anchovies on eaten slices and pepperonis on collected slices are ignored. After all of those scores have been written in the guest check, the scorekeeper adds the points for each player together. The player with the most points is the winner: they get to pick up the check! In case of a tie, the tied player with the most eaten slices (not pepperonis) wins. If there is still a tie, both players share the victory, and the check is split between them. Slices with single numbers on them are the standard pizza types. The number is both the quantity of that type of slice in the game, as well as how many points a player will receive at the end of the game if they have collected the majority of those slices. Most numbered slices have pepperoni on them. Eating these slices results in +1 point per pepperoni eaten. Some slices have anchovies on them; if these slices are collected, the anchovies are subtracted from your score. 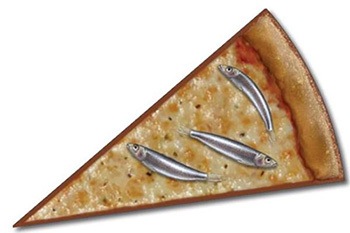 If slices with anchovies are eaten, the anchovies are not counted against you. 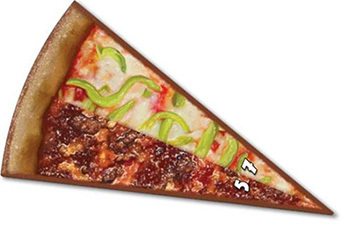 There are four Combo slices, each with two different types of pizza on them. If you have a Combo slice, you have an additional 1/2 slice of each of the types on that slice. There is never any pepperoni on these Combo slices, so they cannot be eaten (unless you have the Combo Cravings Special). 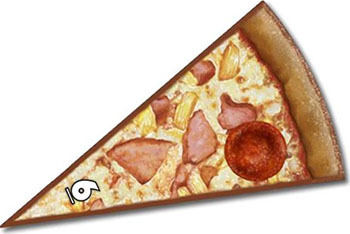 The Anchovy slice cannot be eaten, and is worth -3 points to anyone who collects it. The Supreme slice, when collected, must be placed next to any existing slice, and from that point on is considered to be one slice of that type. It may not be moved to another type. If the Supreme slice is the only slice collected and the player has no other slices, the player must attach a slice to it the next time he collects any slices. The Supreme slice is worth 2 points if eaten because it has two pepperonis on it. Today's Specials provide bonuses and penalties to players. One Special is added to each pizza that is sliced each round. Players may have any number of Specials. Normally, a Special is added to a portion of pizza by the Slicer. The player who chooses that portion receives the Special in addition to any slices in that portion. Specials may form their own portion of the pizza (the total number of portions must equal the number of players when the Slicer slices, including a Special-only portion, if there is one). Specials (marked with a *) are scored on the Guest Check's Special* line at the end of the game. Gain 1 point for each different type of pizza you've collected. Half slices count as two types if you don't have those types. The 3 Anchovy slice counts as a different type. The Supreme slice counts as the type of slice it is attached to, not as a different type of slice. Each Combo slice in your eaten stack is worth 3 points. If you have any collected Combo slices, you may eat them when you receive this Special, and you may eat any Combo slices you gain on that or future turns (but only on the turn you gain those Combo slices). 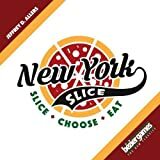 On a future round when you are not the Slicer, you may play this tile immediately after the Slicer has finished dividing the pizza into portions, and choose your portion before all other players. If this Special appears on the last round of a game, or in a two player game, choose another Special from the stack. In a future round, before the Slicer slices, you may call Dibs on a slice and take it from the pizza. When Dibs is out (not yet used but owned by a player), the slicer must ask if the player would like to call dibs on a slice before he slices. If this Special appears in a two player game, choose another Special from the stack. At the end of the game, all players except the owner of this Special lose 1 point for every two slices they have eaten, rounded down. For instance, if another player had eaten seven slices, they would lose 3 points. Immediately (after you take your portion of slices, but before you decide to eat or collect the slices) take one slice from the three extra face-down slices. Do not look at any of the slices before you take that slice. You may eat or collect the Mystery slice. If you eat the slice, do not show it to the other players. Just before scoring, you may eat as many slices of one type as you would like (as long as that type has pepperonis on it). Note that this happens before any scoring. On a future round when you are not the Slicer, you may shift one slice from one portion to another adjacent portion just before you select your portion. If a portion has been removed already, the slices on either side of the removed portion are considered adjacent to each other. This may only be done once. If this Special appears on the last round of a game, choose another Special from the stack. Collected Combo slices are worth two slices of each type on the Combo slice instead of half a slice each. You win all ties for majority of types collected. Instead of anchovies being subtracted from your score when collected, collected anchovies are worth +1 point each. Eaten anchovies are not worth anything. This Special's effects should be recorded on the Pepperonis - Anchovies line on the Guest Check for the player who has this Special, and can be done very easily by changing the - to a + on that line. Each slice of Veggie 3 pizza in your eaten stack is worth 3 points. If you have any collected Veggie slices, you may eat them when you receive this Special. If this Special appears in a two player game, choose another Special from the stack.